Tooth decay is the most common chronic disease among children, and, unfortunately, children who develop cavities in their baby teeth are more likely to develop cavities in their permanent teeth, as well. Protect your child from tooth decay and other oral health issues by taking steps to care for your child’s teeth throughout his or her childhood. Prolonged exposure to sugar-containing liquids can cause tooth decay in children, so limit your child’s consumption of sugary beverages like soft drinks or fruit juice. If you give your child a sippy cup for long periods of time, fill it only with water and don’t allow him or her to take it to bed. Children should learn to drink from a regular cup as early as possible; liquid is less likely to collect around the teeth that way. You also should limit your child’s consumption of sugary or starchy snacks, especially those that can remain stuck in the teeth after eating. 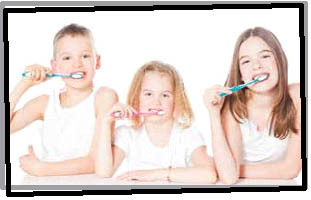 The best way to prevent oral health problems is to take your child to a dentist regularly. After your child’s first dental visit—which should occur six months after the child’s first tooth erupts or by the child’s first birthday—he or she should see the dentist every six months. Some dentists schedule appointments for very young children with decay every three months; early visits will help familiarize your child with the dental office, reducing anxiety and making future visits less stressful. In addition to examining the development of your child’s mouth, the dentist can teach you how to ensure good oral health and recommend special preventive care if necessary. Give your child fluoridated water, whether it’s bottled or from the tap. Lead by example: Brushing and flossing your teeth with your child will teach him or her to understand the importance of good oral hygiene. For more oral health tips, please CONTACT us.